The mission of the Crystal Lake Sailing is to make the sport of sailing available to the youth of Benzie County. The CLSS is dedicated to the proposition that the life skills of self-reliance, teamwork, and resourcefulness are a major component of mastering the art of sailing. 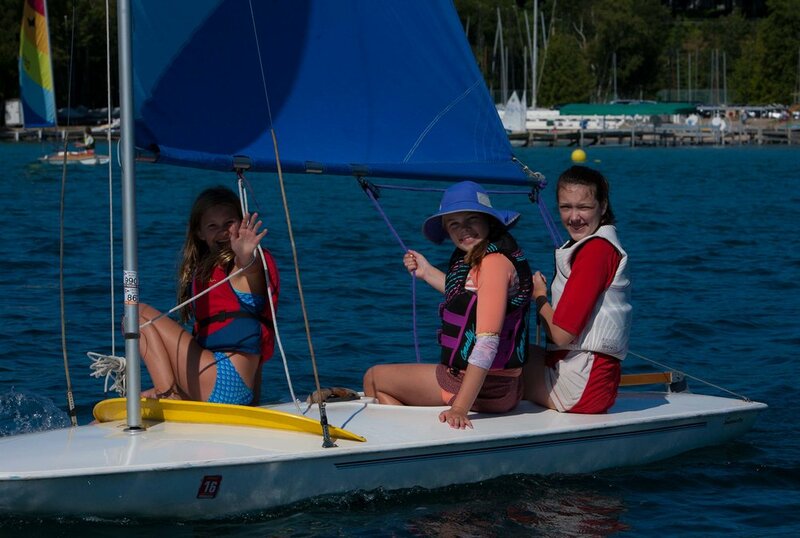 Whether student interest lies in simply acquiring basic sailing skills or in competitive racing, CLSS consistently promotes the values of independence, responsibility, safety, learning, and achievement. The Sailing School opened its doors in 2009 and has been teaching kids to sail ever since. It operates from the beautiful beach at the Crystal Lake Yacht Club at the west end of the Lake. Located just inland of Point Betsie, the west end of Crystal Lake is surrounded on three sides by Lake Michigan, so north and south winds blow unimpeded across the water, usually without kicking up too many waves. Like elsewhere on the Lake, the water is crystal clear, with the bottom visible to a depth of 20-30 feet. The Crystal Lake Sailing School is a Section 501(c)(3) tax exempt non-profit organization. The School’s operations are independent of the Yacht Club’s, and the School leases its space from the Club. The School is supported by private donations and volunteer efforts, as well as by lesson fees.